SERVPRO of Edison takes pride in their work. After removing the wet contents, and drying the structure, the basement was encapsulated. 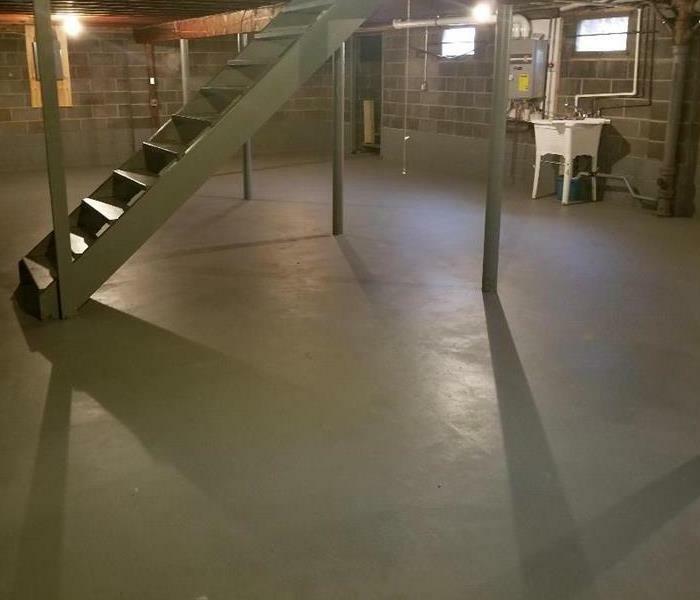 The clean basement is "Like it never even happened." This was the state of the basement when we arrived. The owner had significant content in the basement. The sewer had been backed up and the water in the basement left for a long time. The transformation of the basement was amazing. Water damage can come from any number of sources. Whether it comes from a broken pipe, an overflowing toilet, a failed water heater, or a bad storm. 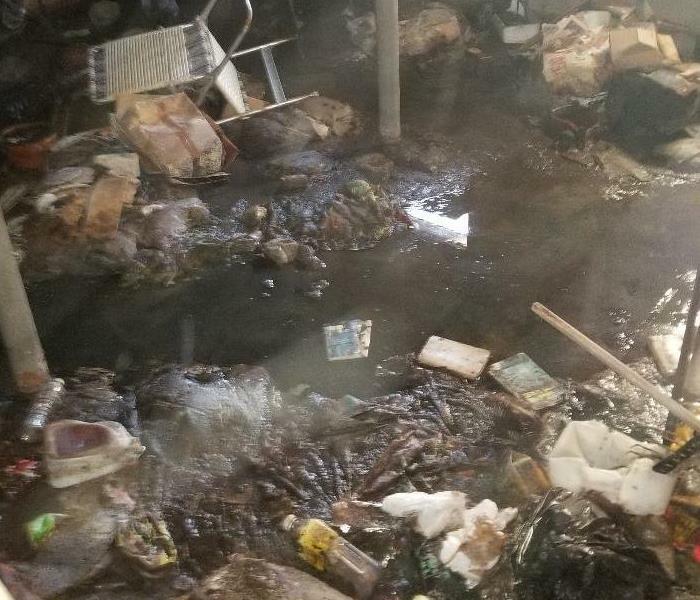 In this unusual instance, an above ground pool collapsed sending water crashing through the back door, instantly flooding the entire finished basement. After extracting water from carpets, moisture still remains in the affected areas. Think of it like your laundry - even though the spin cycle removes a lot of the moisture in the washing machine, you still put your clothes through the dryer. SERVPRO of Edison uses dehumidifiers and air movers to remove any remaining moisture to ensure that the home is healthy and dry. In this photo, water came from the room above, so two air movers are aimed at the ceiling, one is drying the carpet and the dehumidifier works to reduce humidity in the entire room. One of the most important factors in any water damage event is a good extraction. In the photo, one of SERVPRO of Edison's highly trained technicians uses an extraction wand to remove water from a flooded carpet. The mold shown in this picture was the result of a water damage that was not properly addressed by the homeowner. A sink overflowed in the kitchen on the first level of the house, and though the room appeared to be dry after a quick mopping, they never thought to check the underside of the floor. Moisture had gotten trapped in the insulation directly below the kitchen and kept it pressed up against the bottom side of the flooring. As a result, mold grew on the rafters and sub-floor. 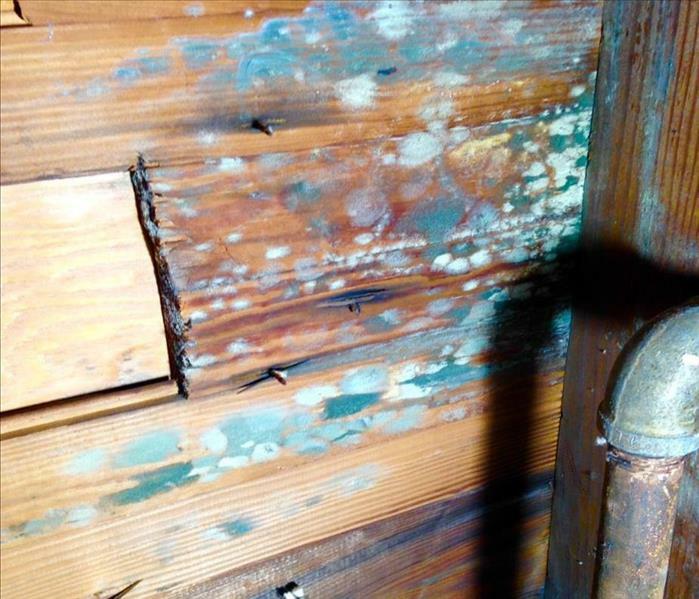 SERVPRO of Edison handled the mold remediation by removing the wet insulation, treating the affected area applied antimicrobial techniques and drying the remaining wooden structure. During a mold remediation it is important to control for mold spores and other particulate matter that may become airborne. That is why SERVPRO of Edison uses High Efficiency Particulate Air (HEPA) Filter Air Scrubbers. The picture here shows just how much dust and debris one Air Scrubber can capture and clean out of the air on a typical job site. SERVPRO of Edison adheres to strict industry standards of how to safely handle mold remediation. One essential part of our procedure involves a HEPA Vacuum to remove mold spores to minimize the risk of further airborne contamination. Fallen candle ignites laundry, causes extensive damage. The fire damage in this closet was caused when a candle was accidentally knocked off the dresser into a pile of laundry on the floor. Notice how even though the fire began on the floor, the majority of the smoke damage is up at the ceiling. The whole bedroom where the fire started needed to have the drywall removed and the framework encapsulated. Smoke and soot spread throughout the rest of the house and SERVPRO of Edison worked to make this disaster, "Like it never even happened." After a serious fire, like the one in this Woodbridge home, it is necessary to remove as much of the charred structure as possible. However, smoke odor can persist even after the worst of it is gone. This photo shows how SERVPRO of Edison encapsulated the remaining framework to seal in smoke odor. Tom, one of our project managers, demonstrates the proper way to remove soot and smoke residue from drywall. The homeowner attempted to clean this fire damage by themselves and caused the soot to smear and lock permanently into the paint. When they realized their error, they called SERVPRO of Edison to bring much needed expertise. One of the techniques SERVPRO of Edison employs to determine the extent of damages caused by a fire is shown in this photo. Our technicians use "Chemsponges" to remove soot and smoke residue from the walls and ceiling. By placing an "X" within a square, we are able to demonstrate how much of a difference our cleaning process can make. SERVPRO of Edison is at the ready 24/7. This assisted living center had a sprinkler head break in the middle of the night and SERVPRO responded immediately. Our technicians know that a fast response is important when dealing with a commercial water damage, especially when it affects the living arrangements of our senior citizens. When this dental office flooded, SERVPRO of Edison came to the rescue to dry and sanitize the affected rooms. You can see one of our Water Remediation Technicians, Kevin, in this photo taking special care to monitor the drying process. The water damage in this healthcare facility was caused by a construction crew working after hours on a renovation. A water supply line broke sending water throughout 17 exam rooms and labs. SERVPRO of Edison had a crew on site within the hour and worked late into the night to extract water. The photo shows the special care our crews take to remove wet insulation that was trapped inside the walls. Hospitals and doctors offices use a special type of flooring to prevent the spread of infection - so the floor and walls meet at a curve. With this in mind, our crews cut 6 inches above the intersection to remove wet insulation and allow for easy repairs. A high end retail store in the mall all of a sudden found themselves in the middle of a flood. The restaurant next door had an ice machine break, causing the water to flood into the adjacent units. SERVPRO of Edison arrived quickly to extract the water and get them back in business! Heavy rains caused flash flooding in the Edison area and some of that rain water found it's way into this ground level family room. After extracting the standing water, SERVPRO of Edison removed the carpet and pad and placed Dehumidifiers and air movers to continue drying the sheetrock. Our technician can be seen in the background of this photo monitoring the drying progress in the walls. Unusually strong winds blew rain water sideways, and into an exhaust vent in this Woodbridge home. The rain water seeped through the plaster ceilings and soaked into the hardwood floors. The photo shows SERVPRO of Edison's drying equipment including dehumidifiers, air movers and the Injectidry system. The injectidry is specialty drying equipment that removes moisture from between and beneath the hardwood floor slats. Last year's "Polar Vortex" forced freezing cold winds to blow for days throughout the Edison area. SERVPRO of Edison was called in to this Colonia home after a pipe froze and caused the ceiling to collapse. 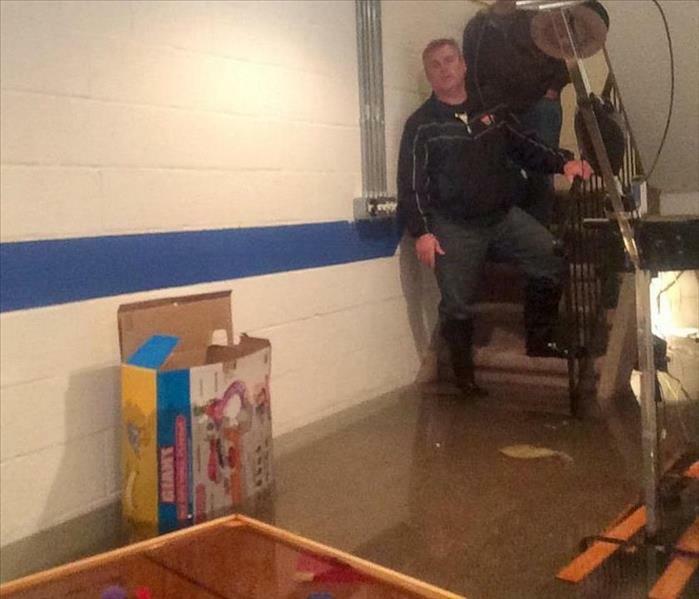 SERVPRO of Edison's owner, Danny Aller puts on the rubber boots and steps into 18 inches of water to assess the damages and determine a drying and restoration plan for this Edison basement. Each of our highly trained technicians at SERVPRO of Edison is equipped with full face respirators. Our crew gets FIT tested annually to make sure the masks keep them safe when handling dangerous mold. 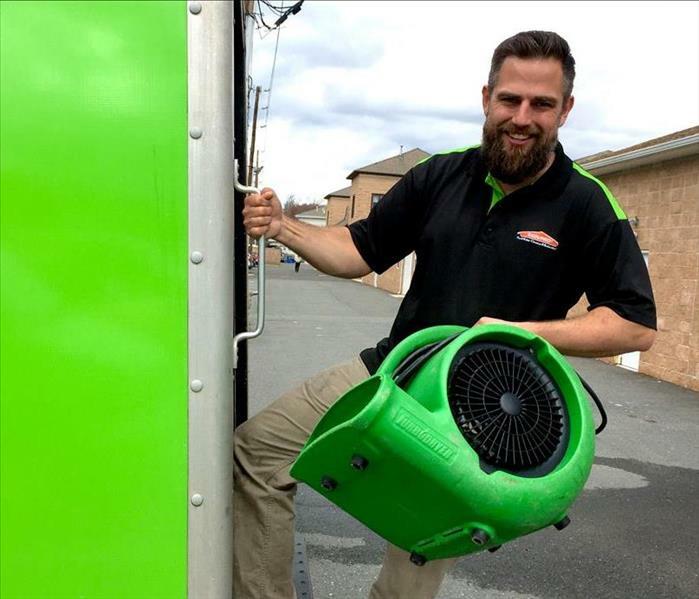 Danny Aller showcases some of SERVPRO of Edison's drying & restoration equipment. The two large machines on the right are Low Grain Refrigerant Dehumidifiers which are essential tools for drying out any water damage. 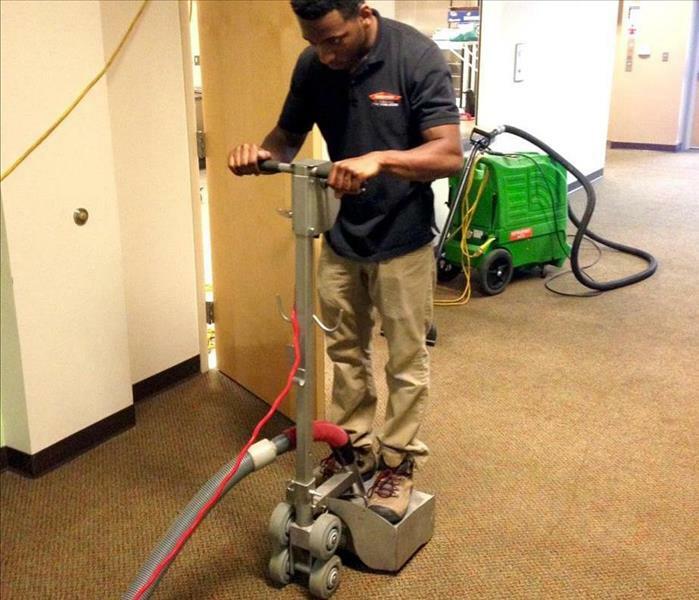 After cleaning the carpets at a local church, Isaiah was eager to use SERVPRO of Edison's "Extreme Extractor". This motorized extraction tool uses the technician's body weight to squeeze more water from the carpet. Ryan is getting one of our trucks prepared for the weekend. Whether it’s a broken pipe, a failed sump pump, or storm damage - you never know what might happen. SERVPRO of Edison is ready for anything. No job is too large for SERVPRO of Edison. Our highly trained staff suited up to clean a waste water treatment facility that backed up 40’ deep in dirty water. Danny Aller tells our local television station all about SERVPRO of Edison's flood, fire, and mold remediation services. We are on call 24/7 for emergency response to Fire & Water Damage Restoration. 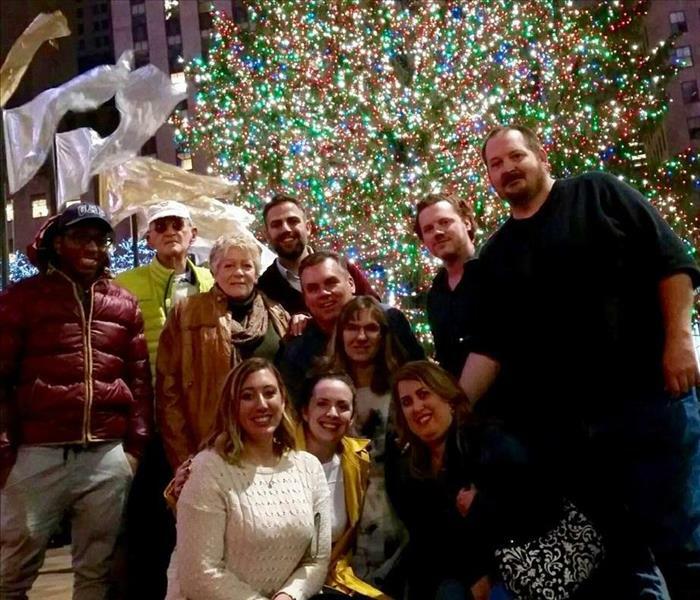 SERVPRO Of Edison celebrated Christmas together with a Billy Joel concert at Madison Square Garden. Our favorite songs? River of Dreams Pressure Movin' Out We Didn't Start the Fire We ended the night with a beautiful view of the Rockefeller Christmas tree! Merry Christmas & Happy New Year to you & yours! 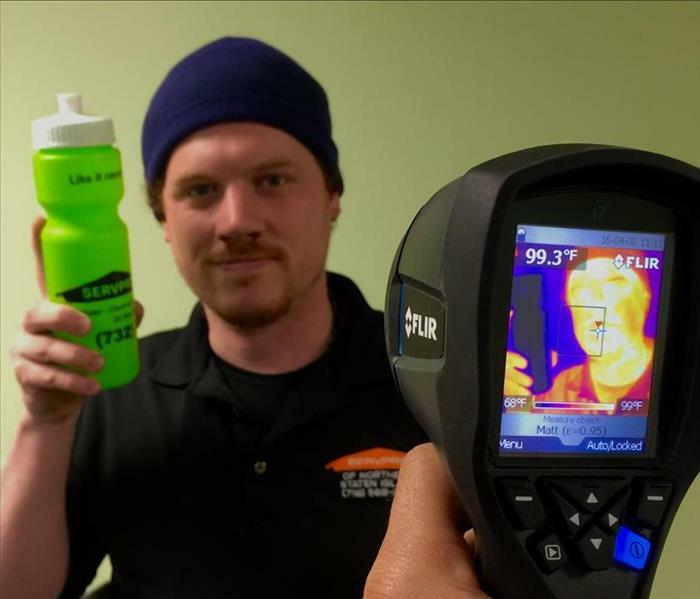 Kevin demonstrates how SERVPRO of Edison's thermal imaging camera can help locate moisture in a home or commercial building that has been affected by a flood. Notice how the bottle of water he is holding shows up a deep blue on our camera? This tool helps us determine the extent of the damage so we can make it "Like it Never Even Happened"